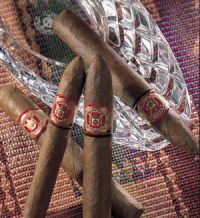 Named in honor of its legendary creator and Fuente family patriarch Don Carlos Fuente, Sr., Arturo Fuente Don Carlos cigars are one of the world's finest smokes. To create this masterpiece, Carlos Fuente, Sr. blended together rare, vintage tobaccos that were hand selected and aged as much as 10 years. These cigars are rich and flavorful, with flawless African Cameroon wrappers, making them as appealing to the eyes as they are to the palate.